An arbitrary waveform generator is an instrument that can generate repetitive or single shot signals. The signals can have a predefined standard shape like a sine wave or a square wave as in a conventional function generator. However, the signals can also have an arbitrary shape, defined by the user. These signals can be created using the Multi Channel oscilloscope software or an external program or can be signals previously measured by the oscilloscope and loaded in the generator. A function generator is an essential instrument in testing circuits. It can be used to apply a signal to a circuit under test, to test the functionality of that circuit. A specific application of an arbitrary waveform generator is the ability produce signals that simulate certain external conditions without the need of having the actual condition. An example of this is generating a previously measured crankshaft sensor signal and apply that to the motor management system of a car. Various parts in the motor management system can then be tested without the engine having to run. Also systems relying on serial communication signals can be tested this way. TiePie engineering instruments that include an arbitrary waveform generator are the Handyscope HS5 and the Handyscope HS3. The function generator features a large display showing the signal shape of the actual signal being generated. Convenient toolbars with clear buttons are available for signal settings and common operations. They show the current settings of the instrument and allow to change all settings. The large buttons are very suitable for touchscreen operation. The toolbars are fully configurable through the program settings. You can set the button size, add or remove buttons and change the order of the buttons. Arbitrary waves can be previously measured signals, which can be loaded from a file or can be transferred directly from the measuring instrument. These can also be signals created in an external application. To adjust a signal property, click the digits or scroll the mouse wheel when the mouse pointer is over a specific digit. Clicking the upper half of a digit will increase the value of that digit, while clicking the lower half of a digit decreases it. Digits that are currently off, can be enabled by clicking their upper half. Properties can also be adjusted by clicking the label with the name of the property or pressing the corresponding hotkey. This opens a dialog in which the requested value can be entered. This dialog accepts prefixes like u, m, k, M, etc. The function generator has a sweep function that allows to perform a linear or logarithmic continuous sweep with the selected signal type (sine, triangle or square). Begin and end frequency of the sweep can be set, as well as an optional starting frequency between the begin and end limits. The duration of the sweep is also adjustable. With the generator mode, the function generator can be set to generate continuous signals, generate in burst mode or generate in gated mode. In continuous mode, the function generator generates the selected signal continuously until stopped. Starting is done using the Start/Stop button or via an external trigger signal. In burst mode, the generator generates a burst of the selected signal and then automatically stops. The burst length is set to a number of cycles of the selected signal. Each burst start will generate the selected amount of cycles of the selected signal. 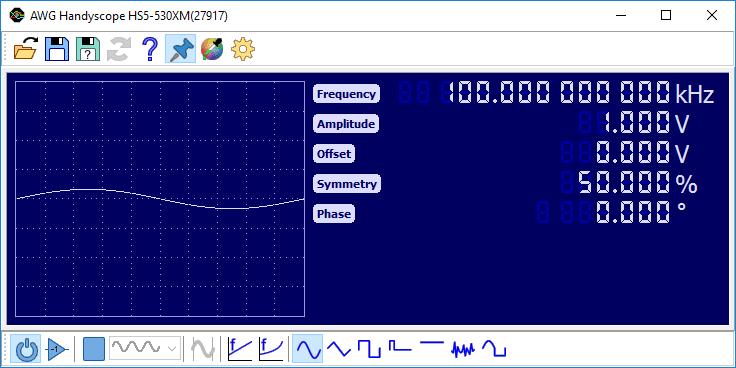 For arbitrary signals, the pattern buffer can also be divided in segments, allowing to generate segments of the waveform. Each burst start will generate the next segment of the total pattern. A burst can be started manually using the Start/Stop button or can be started by an external trigger signal (TTL). In gated mode, the generator generates a signal based on the presence of an external trigger signal. Various different gated modes are available to control how the generator responds to the external signal.